There comes a point where you shouldn’t mess with perfection. 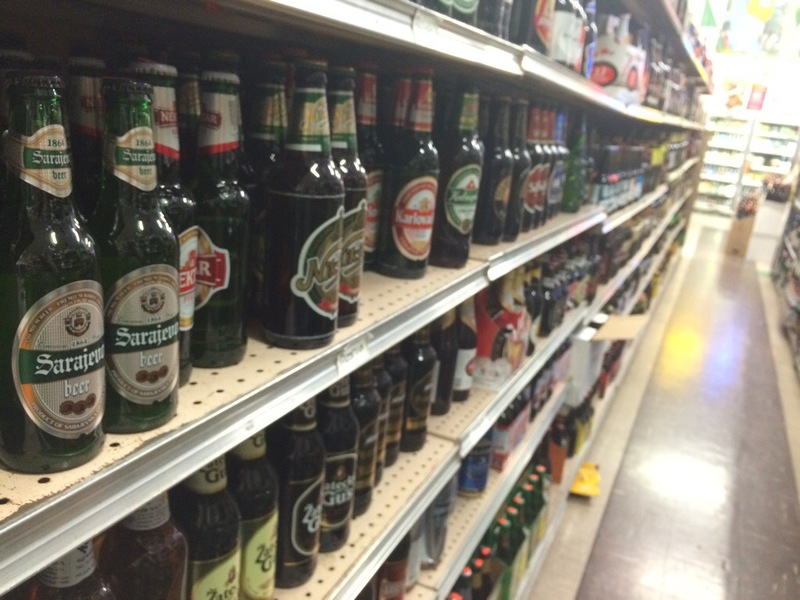 Beers from dozens of countries line the aisles at SW Portland’s Johns Market. At Laos, I reached that point. Up to now, I’ve followed a similar formula for working on this blog: Once I figured out what dish to make, I’d look up a few recipes for it, taking elements of each to come up with my own special blend (based mainly on my culinary skills and what looked good about each recipe). 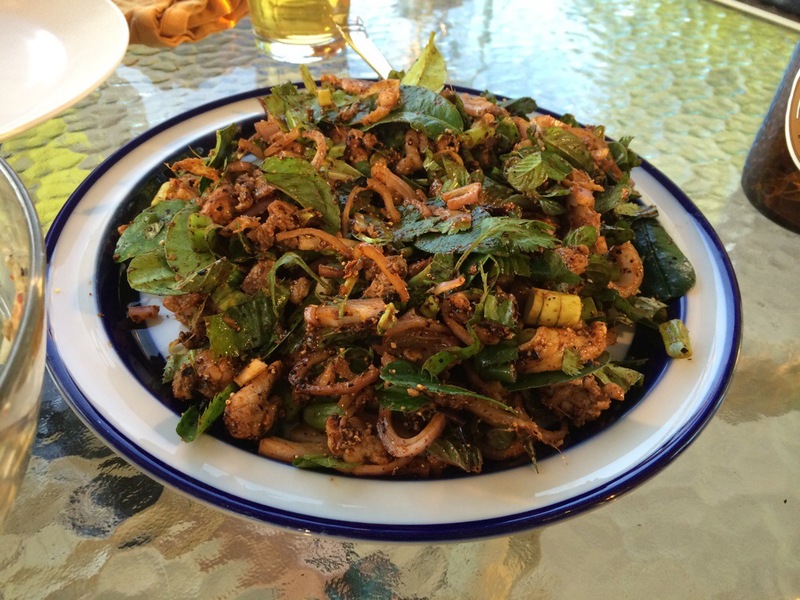 I started to do the same with laap, or larb, often pitched as Laos’ national dish. At some point, though, practicality got the best of me: Why would I try to do this on my own, when I had the work of a genius at my disposal? 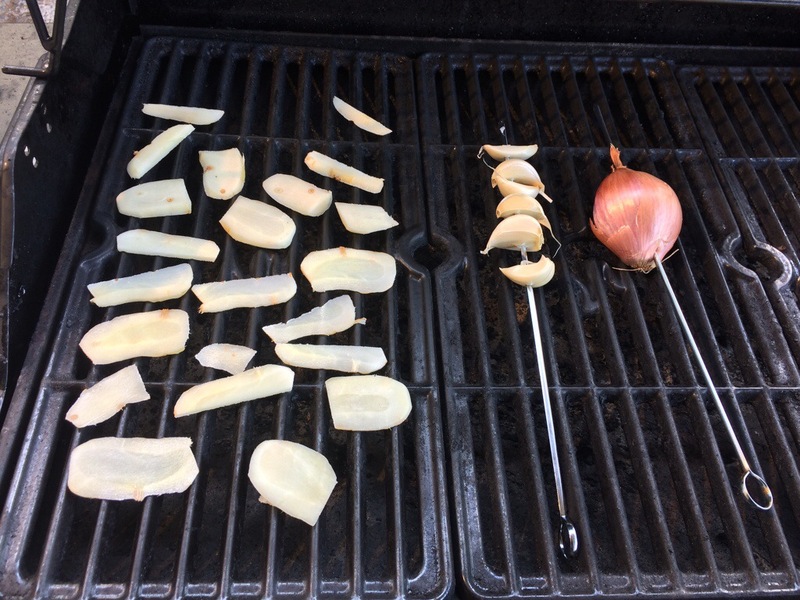 For the laap, galangal, garlic and scallions are grilled, almost seared. Visitors to Andy Rickers’ Pok Pok restaurants, in Portland and New York, know what I’m talking about. Adventurous Southeast Asian food that tastes good. So I perused the Pok Pok cookbook, which was Emily’s birthday gift last year, and found a recipe for Laap Isaan, from laap from the eastern side of Thailand, and inspired by Laotian cuisine. I made Ricker’s Laap Isaan with chicken instead of duck, and left the heart out of the meal (but did include liver and skin). To go along with it, I made Laotian papaya salad from the cookbook – minus the crab, which I couldn’t find after a pretty thorough trip through Portland’s Asian grocery mainstays. As an added bonus, I took a trip to John’s Market in Southwest Portland to pick up Beerlao, a rice-based lager from Laos. Ricker’s recipes can be fussy. There’s no other way around it. I had to prepare two of the laap’s ingredients well in advance – a chili mixture and sticky rice powder. Another took more than an hour of grilling and pounding. All told, I spent six hours preparing this meal, four the night of, although admittedly I was distracted by Hyun-Jin Ryu’s near-perfect game. It was worth it. This was easily the tastiest meal I’ve made since starting the project. I’m not going to re-print Ricker’s recipes. They’re good enough that I’d urge you to pick up his cookbook instead. Or, as Emily pointed out, “You’ll spend less time by going to Pok Pok and just waiting in line.” But that’s no fun, is it? One word of warning – go light on the chilies in the papaya salad. I think the recipe called for 4 soaked chilies… I’d dial that back to 3. 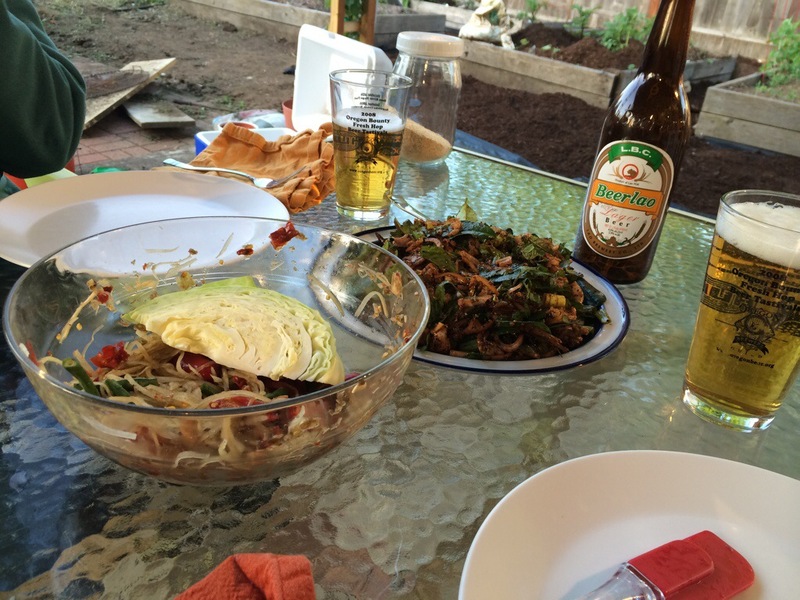 Finished laap – a heap of vegetables and a heap of delicious meat. Papaya salad (left), laap (center) and Beerlao. Hey! I was at that game!